Friday 13th May 2016 saw the start of this year's 1940s Weekend in Haworth - and what initially appeared to be a lucky day for the event's ever popular but accident prone RAF pilot Lt. Cmdr. Rodger "Dodger" Overandout. The hapless hero was allegedly reported* spotted taking part in a dogfight with an enemy plane over Haworth village. Whether our man actually managed to shoot his adversary down is unclear (he's never managed to do so before) the pilot of the enemy plane was seen to bail out safely before his plane ended up embedded in the side of a building just opposite the village railway station. 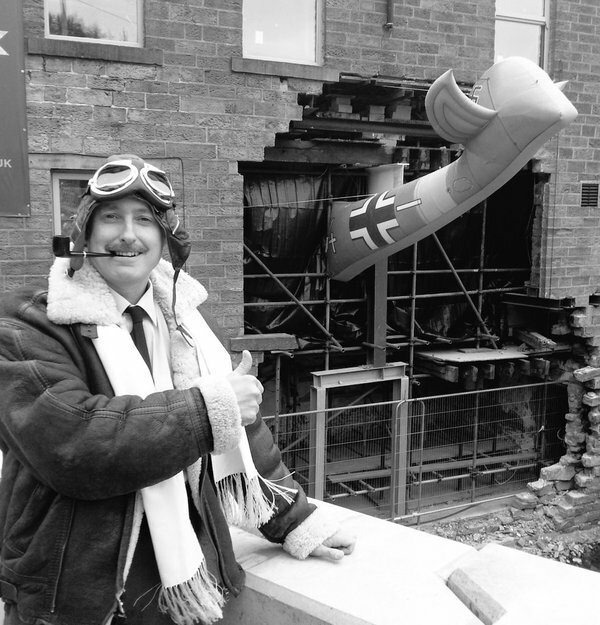 More thorough investigations however revealed that the "downed plane" was in reality an inflatable model which had been jokingly placed in an existing hole in the side of what was formerly the Royal Oak pub: the breach in the wall actually being damage from the floods which hit the Mill Hey area at the bottom of the village in December 2015 ! The building is currently underdoing repairs, and is expected to open for business as a new pub called the Mill Hey Brew House later in the year. No doubt Lt. Cmdr. Rodger "Dodger" Overandout will be "dropping by" for a drink, though hopefully the "air conditioning" will have been sorted out by then !